Enter to win one of eight copies of The Creation of Anne Boleyn: A New Look at England’s Most Notorious Queen. Enter soon as the closing date is April 4th! You can now visit Amazon’s Susan Bordo Page by clicking here. Pre-Order on Amazon is Now Available! 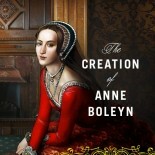 The Creation of Anne Boleyn is now available for pre-order on Amazon! Both hardback and Kindle options are available. Enter your email address to follow press releases and receive notifications of new posts by email.